Carmel High School swimming coach Chris Plumb had more questions than usual entering this season. 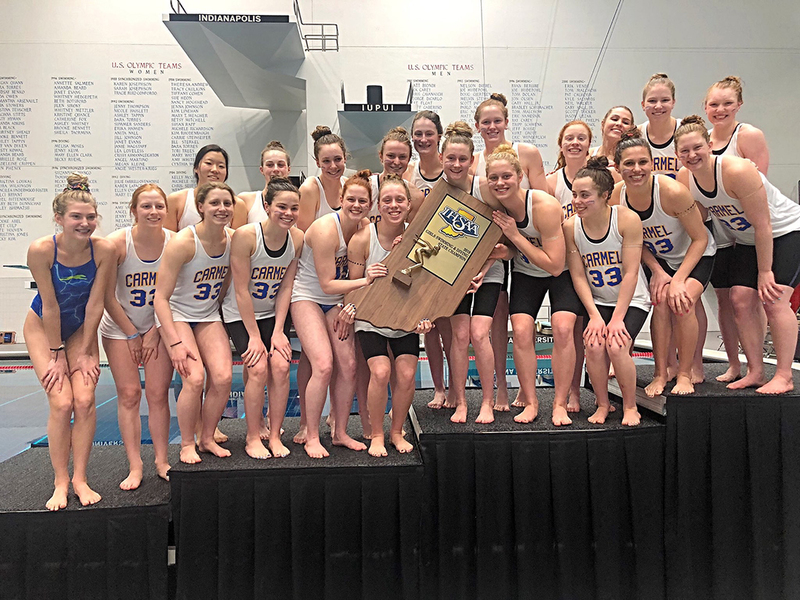 They were all answered Feb. 9 as the Greyhounds captured their 33rd consecutive girls state swimming championship, including 13 under Plumb, at the IU Natatorium at IUPUI. Carmel won with 413 points, well ahead of Franklin with 167.5. CHS extended its national record for consecutive state high school titles in any sport. Plumb pointed out senior Kendra Bowen developed from being an alternate on a relay two years ago to winning the 200-yard freestyle in the state finals. Bowen also was on the winning 200 freestyle relay team. “That’s a tribute to the program and her work ethic and drive,” Plumb said. Senior Kelly Pash captured the 200 individual medley and the 100 butterfly. Pash was on the winning 200 medley relay and 400 freestyle relay teams. “She emerged as a leader, especially these last two months. She really stepped forward and realized that her role was not only in the pool but outside the pool as well,” Plumb said. That gave her 12 state titles in her career. Pash won the 100 and 200 freestyle as a junior. “I had to do what was best for the team and it was fun to race new races,” Pash said. Plumb said the Pash’s sacrifice is a tribute to the team’s culture. Plumb said his team maintained that culture despite obstacles. The team, which practiced at several different high schools and IUPUI, had to swim three days in a row from 5:15 to 6:45 a.m. at North Central to get pool time. “It speaks to their willingness to put all that stuff aside and swim for each other,” Plumb said. Several of the girls wore jerseys with the No. 33 on it, signifying the state titles. It’s also the uniform number worn by Boston Celtics great and Indiana Pacers consultant Larry Bird. Team members were hoping Bird would show up at the state finals. Plumb said a parent heard through a Pacers contact that Bird didn’t want to appear to support one team over another. “We still tried to swim with the same grit and determination that he had,” Plumb said.